Before being elected to Congress to represent Illinois' fifth district in 2009, Mike Quigley spent 20 years in public service in Chicago. But Quigley had another tool at his disposal when he came to Washington: He was a hockey player. "Playing pond hockey [growing up], we made our own nets. My brother made one out of wood and chicken wire and nails," Quigley said. "I fell back onto it and cut the back of my scalp top to bottom. I finished the game. After that, how tough can politics be?" In addition to his work in the U.S. House of Representatives, Quigley has served as chairman of the Congressional Hockey Caucus, worked with the USA Warriors hockey program, and been an advocate Hockey is For Everyone and Hockey on Your Block, a Chicago initiative aimed at giving disadvantaged youths a chance to discover the game. In 2011, the Democrat even took to the House floor to spotlight the NHL's official designation of February as "Hockey is for Everyone Month." "I just appreciate the people out there promoting the game," Quigley said. "They're teaching kids who have never played before the basics of the game. That's happening all across the country. They're bringing kids into this wonderful sport." Quigley isn't just voicing his support. He's lacing up his skates too. Last weekend, he participated in a charity game at Soldier Field featuring members of the Chicago Blackhawks and the USA Warriors sled hockey team. This weekend, Quigley is competing on a team representing the FBI in a charity game against a team made up of Chicago police officers. 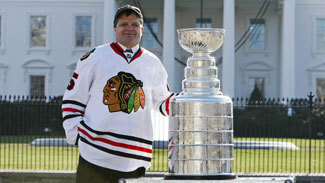 A lifelong Blackhawks fan, Quigley was able to celebrate with his team when they won the Stanley Cup in 2010, hosting the team and the Cup at numerous events when they visited the nation's capital later that year. Quigley -- who took over the congressional seat formerly held by Rahm Emanuel, the current Chicago mayor and former chief of staff to President Obama -- is thrilled about the Blackhawks' great start this season, but he's just as thrilled to be partnering with them. "One of the things the Hawks have done with me is we're trying to put a floor hockey program in every gym and school in our city that wants one," Quigley said. "Ice is tough, but the game is great whether or not it's on ice."